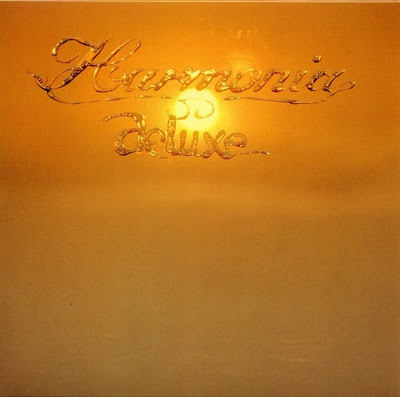 Deluxe is the second album from the highly influential Krautrock/Kosmische Musik group Harmonia. Harmonia was formed by the addition of Neu! guitarist Michael Rother to Cluster, the duo of Hans-Joachim Roedelius and Dieter Moebius. Deluxe was recorded in June, 1975 in Harmonia's studio in Forst, Germany. It was first released on the Brain Records label in 1975. It was produced by the band members and legendary Krautrock producer, Conny Plank. Ned Ragget's review for Allmusic opens: "A touch more immediate and song-oriented than its predecessor, but no less enchanting and lovely to hear, De Luxe again features the trio experimenting with a variety of approaches, most particularly including vocals here and there for the first time." The Ground and Sky review by Joe McGlinchey describes Deluxe, in part: "The album also has more of a drive to it than the first Harmonia album, perhaps in part to Rother's guitar being much more upfront and noticeable, as well as the addition of Guru Guru drummer Mani Neumeier on some tracks." Neumeier performs a lengthy jam on the track "Walky Talky". Ned Raggett adds: "The motorik pulses and rhythms, however soft and subtle, still dominate the proceedings, while the glazed, warm feeling of the whole album is astounding."